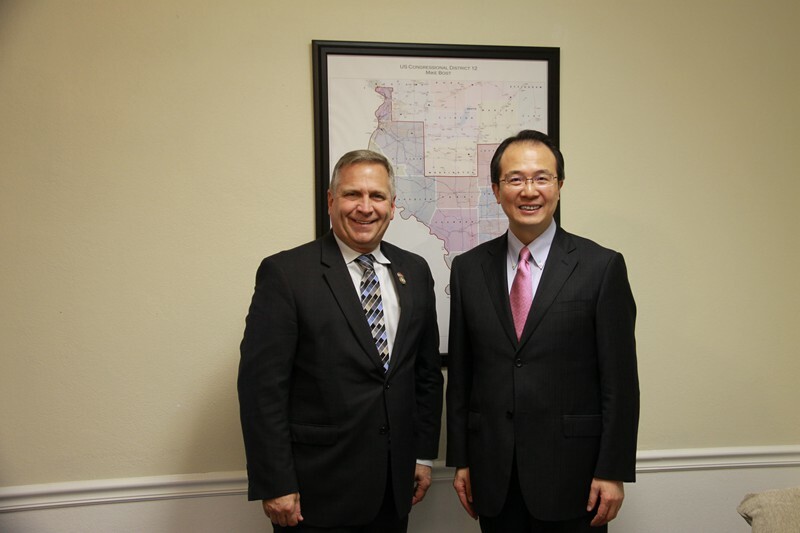 Consul General Hong Lei met with Congressman Mike Bost at O'Fallon, Illinois on April 21. Consul General Hong Lei elaborated on Sino-US relations, economic and trade cooperation and people-to-people exchanges between China and the Mid-west, saying that the common interests of China and the United States get bigger, cultural and people-to-people exchanges become closer, and the two countries' role in international and regional affairs becomes more significant. Sino-US relationship has become the world 's most important bilateral relations, and cooperation should be the only right choice for the development of bilateral relations. Consul General Hong Lei said that President Xi Jinping and President Trump held an important meeting in Florida's earlier this month, marking the general direction for the further development of Sino-US relations. China's cooperation with the US Mid-west will usher in a brighter future. We hope that Congressman Bost will continue to care about and support the development of Sino-US relations and strengthen the mutually beneficial cooperation between China and the Mid-west. Congressman Bost said that he was delighted to see the positive outcome of the US-China heads of state meeting earlier this month. He represents the 12th district of Illinois which is an important coal production base with developed inland water transportation and strong capability of clean coal technology research. Employment is the key to people's livelihood. He hopes that China and the United States will strengthen cooperation and create more employment opportunities so as to bring more benefits to the people. He is willing to strengthen communication with China and share good practices with China on industrial restructuring, clean coal technology applications and other areas to achieve win-win results.